Are Binary Options Safe? Read Before Opening Your Wallet. Have you stumbled upon those aggressive ads that invite you to invest with Binary Options and earn big money in half an hour? They undoubtedly sound lucrative, but before you jump in and open your wallet to begin trading, you need to know what is behind Binary Options. Are Binary Options safe to invest? Are you able to make money with them? Well, let’s dive into the details. 1. Where Does the Name Come From? Binary Options are internet based trading options that offer investors fixed price and fixed return. For these reasons are they also known as “Fixed Options” and “Digital Options”. Sometimes these options are called as “all-or-nothing” because either you get the entire payoff or nothing at all. People like the fact that they know beforehand an exact amount that they can earn. And if they happen to lose, they lose only a fixed amount of their investment. The name Binary derives from the structure of the option – there are only two possible outcomes. Either you are correct or wrong. The most frequent type of Binary Options is a high-low option. It means you follow the market’s direction and wage if the price of the underlying asset is above or below a certain level after a fixed amount of time. If you happen to be right, you earn a profit. However, if you are wrong, you lose your investment. Note! Unlike other types of options, you are NOT allowed to sell or purchase the underlying asset. Each Binary option has its expiry time (usually from 60 sec to 30 minutes to few hours or the end of the market day) and a strike price (predetermined price or current price). The only thing you have to do is to predict if the price of this underlying asset will be above or below the strike price at the time of expiry. In a word, you wage whether the future price of a certain asset will be higher or lower than its current price. If you wage correctly, and the price is on the right side of the strike price then it is said that the market expires “in the money” – Congrats! You made a profit. If you wage incorrectly, and the price is on the wrong side of the strike price then it is said that the market expires “out of money” and you lose your investment. When you believe that the market is rising then, you want to buy a “call/up”. For a “call” to make money, the market price must be above the strike price at the time of expiry. A. You predict that the market grows. It grows, and the price expires above the strike price – you make a profit. B. You predict the market grows, but the price falls and expires below the strike price – you lose your investment. If you believe that the market is falling, you want to buy a “put/down”. For a “put” to make money, the market price must be below the strike price at the time of expiry. A. You predict that the market falls. It falls, and the price expires below the strike price – you make a profit. B. You predict the market falls, but the price grows and expires above the strike price – you lose your investment. Most of the Binary Options Trading Platforms offer you 70-85% profit if you wage correctly. In case you wage incorrectly, they sometimes refund a small portion (5-10%) of your deposit. However, this small refund is not typically the case. More often than not you are left empty handed. 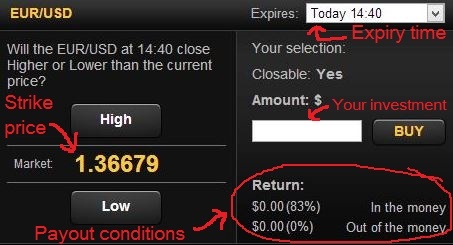 Let’s assume you invested $1000 into EUR/USD option with payout conditions like this: 83% profit if the market expires in the money. You lose all if it expires “out of money”. Let the expiry-time be after 5 minutes, and the strike price is $1.36679. If the price expires in the money, you make $830 profit in just 5 minutes, and now you have $1830. If it expires out of money, you lose all your investment. However, even with your loss, it is still a positive aspect of the Binary Options – you can only lose a fixed amount of money. But be careful – if you don’t know how to trade then, you may quickly go into bankruptcy. 3. A real trading… Or gambling? As you see, Binary Options are easy to understand and very simple to use. And this is the reason they have attracted an enormous number of complete newbies into trading business. But don’t kid yourself! A 75-80% profit in a very short time sounds undoubtedly lucrative, but it doesn’t necessarily mean that you can succeed with Binary Options. The more popular Binary Options become, the more trading platforms appear every day. Many of them are pure scams sites; others are considered as important trading platforms. However, by nature, they are merely gambling sites. They’re like online poker sites or casinos, yet interestingly people seem to respect them higher because Binary Options look like a real trading. They create an illusion as you are offered some form of investing opportunities. Open a new Excel spreadsheet and try it out for yourself. Let’s assume you start with $1000 and after that, you wager the entire amount that you have. 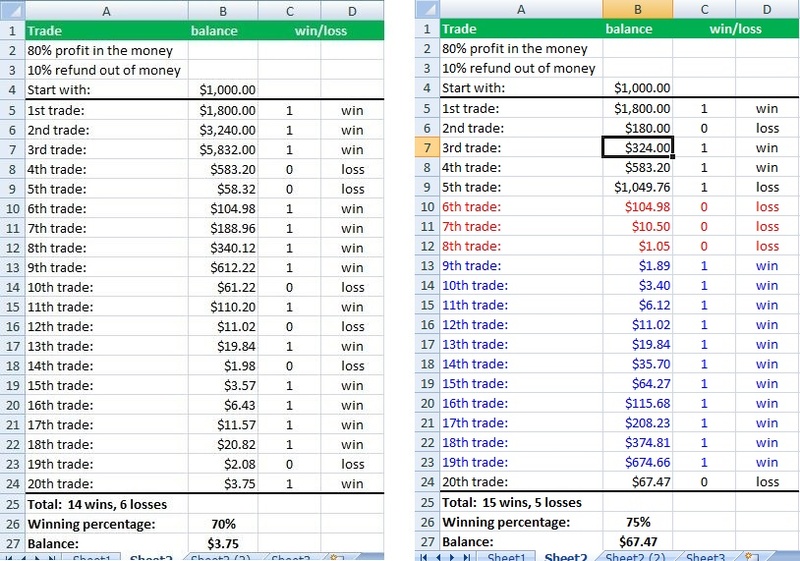 Let the payout conditions are 80% profit on wins and 90% loss in losses. Select B4 to B24, then pressing the right button of your mouse to choose Format Cells -> Number -> Category. Under Category choose “Currency” and press “OK”. The values of C5 to C24 are generated randomly so each time you change something in the spreadsheet, they also change. But you get the picture. If you trade/gamble with Binary Options 20 times and each time invest the entire amount, then it requires quite a few wins to recover each loss. You see, it is easy to run into bankruptcy. Left: You may be right 70% of times and still lose all your money. Right: Just three consecutive losses may destroy you and it requires at least 12 consecutive wins to recover. 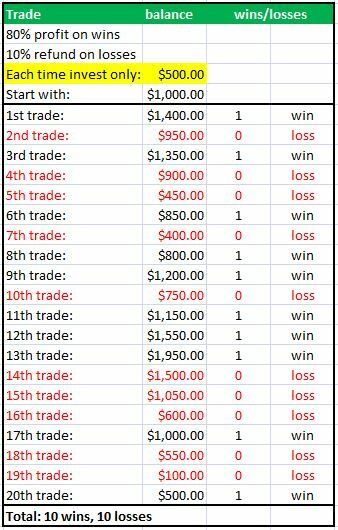 If you invest $1000, and the payout conditions are the same (80% profit on wins, 10% refund on losses), you see that just to break even you must be right four times out of 5. In case there is 70% profit on wins then you lose money even if you are right four times out of 5. Let’s assume now that you start with $1000 and you wager only with $500. Let the payout conditions be 80% profit on wins and 10% refunds on losses. As you see, having an equal number of wins and loses makes you lose money. Either you use entire balance or only certain amount of money, the structure of binary options are designed to force you into bankruptcy. You may win some short-term profit but, two or more straight losses can easily wipe you out. 5. Can I Make Money With Binary Options? Problem #1: There are tons of scam Binary Options brokers out there, probably more than in many other industries. If you happen to stumble into any of them, they rip off your hard earned money and leave you burned and empty handed. Problem #2: Not regulated. The Binary Options brokers market is maturing slowly and CBOE binary trading platform even declared it a legitimate form of trading in 2007, regarding regulations it is still like a “Wild West”. Virtually all those brokers are unregulated by major governmental agencies, and the question is – If so, who is going to protect your interests? Many fraud brokers are popping up, and the number of complaints about fraudulent schemes is only increasing. It is a high-risk territory to enter and start trading with them. Problem #3: A Direct conflict between you and the broker. These Binary Options sites are like casinos, only much worse. You have to understand that there is a direct conflict of interests between you and your broker. If you win, they lose. If you lose, they win. So you see that there is NO interest on their part in your long-term success. It is like blackjack – they offer you a large rake and a small refund, just to keep you coming back. But guess who will be a winner? Not you! Problem #4: Addiction. The Binary Options, being a gambling by structure, can easily become addictive. Especially if you are a starter. Things can get quickly out of your control. The whole industry is built up the way to keep you as a milking cow for brokers. Problem #5: The loss outweighs the payout. The payout structure of Binary Options is designed the way to bring you to your knees. An option, which expires out of money, usually means 100% loss for you. It clearly outweighs the payout (about 50-80%) if you wage correctly. So if you choose to gamble with Binary Options, on average, you should expect to lose money. Problem #6: Impossible to hedge. One of the basic principles of statistics is: less time = less uncertainty. That makes it almost impossible for you to hedge. There is no way to guess what a stock will do within a short period, unless of course, there has just been some major event or announcement concerning it. And it is not just a one-time prediction. You must make correct predictions consistently to break even, let alone making a profit. Problem #7: Software manipulation. There are many Binary Options sites out there that manipulate trading software to make you lose your trades. Either they hold your option after the noted expiry time or they close it few seconds to it, enough for your option to expire “out of money”. Let’s say your option is supposed to expire at 14:30. At 14:30 your option is “in the money” and you should make a profit. But for some reason, your option is kept open until let’s say 14:31. However, this extra minute is enough for your option to expire “out of money” and you lose your investment. There are tons of complaints about manipulations with “delays” like that, but when people try to contact with the brokers, their phone calls are put on hold and emails are ignored. All these Binary Options trading platforms are software based, easily manipulated and this fact doubles or triples the risk to gamble with them. Problem #8: Ethics: These trading platforms advertise themselves with “make 70-85% in an hour”. But they forget to tell you that you may lose 100% in an hour. 6. Are Binary Options Scams? Officially the Binary Options is not a scam. In a financial world, they are declared as legitimate trading vehicles. But not all of them are legit! Especially those who sell you “get quick rich” dreams. And remember – by structure they are still pure gambling sites. The word “trade” does not even “fit” here. But a scam or not, you still have to know how to “trade” to begin with. If you don’t know how to read the charts or trade on “normal” markets, then you are only going to lose money. Interestingly, Binary Options attract especially those who have NO knowledge of trading whatsoever. They are the ones who get burned most. 7. How Much Does It Cost To Join? To start trading with Binary Options, you are asked to deposit a sum of money first. Usually, it is from $20 to $250 or something. You can use your deposited money to buy options. The problem with the deposited sum is that even though you are allowed to withdraw your money anytime you want, then often it will not turn out that easy. There are numerous complaints registered where people have seen hard times trying to get their deposited money back. So even if you are promised that your deposited money is 100% safe, then you still have to be very careful. Refusal to reimburse funds to customers. That is what I already explained in the previous section “How much does it cost to Join?”. Manipulation of software to generate losing trades. That I described in the previous section “Is it possible to make money with Binary Options?” under Subtitle Problem #7. Identity theft. Some binary options trading platforms request photocopies of customers’ credit card, drivers licence data, etc. for usage that they don’t specify. Each trading platform has its positive and negative aspects. The same goes with the Binary Options which come with its advantages and disadvantages. Both, reward and risk are known and do not depend on how much the market moves in your favour or against you. Either you win fixed amount, or you lose fixed amount. 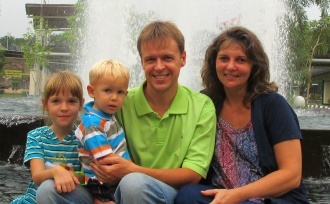 Usually, there are no commissions even though the brokers may vary. The options are easy to understand and simple to use – you only have to decide one thing – the price of the asset is going up or down. Financial „Wild West“. There is a little regulatory oversight by major governmental offices, and so there are institutions, which can protect your interests. No ownership of any asset. Software based trading platforms are easily manipulated to turn your profitable trades into losing ones. Direct conflict of interests. Your win is brokers loss and vice versa. Which means that brokers are NOT interested in your long-term success. It is like Casino where you with your limited equity go against their relatively unlimited equity – your survival as a player is not likely. By structure, Binary Options trading is pure gambling with very little „trading“ involved. You are offered a large rake and a small refund to make you coming back, but this may quickly become addictive. I cannot recommend trading with Binary Options, especially if you are a newbie day-trader. If you want to gamble then it’s your choice of course. But please don’t confuse investing with gambling. Binary Options trading platforms are by structure pure gambling sites. Don’t invest in something that you do not understand! There are other, much safer ways to make money online. 1. For some extra cash: Read my post – Earn Honest Money Online, Sites You Can Trust – here is a list of websites where you can earn some extra cash. 2. For more serious income online: Learn how to build up a successful online business from scratch. 3. In case you want to trade, find some trustworthy trading school and learn to trade in a “normal” way. Do you have any questions or comments about Binary Options? Please leave a comment below. I would love to hear about your thoughts. I’m late to the party but this is very comprehensive and exactly what I was looking for. I agree that binary options is highly associated with risk and gambling. I especially feel this is the case for people that get hooked on 60 second options where no market analysis can actually be done. I appreciate your hard work on this. Thank you, Kane for taking a time to write a comment. I totally agree with you. Plus, they can be very annoying. I once made a free account (in fact, just to learn more about the product) and they just kept calling me. It was so frustrating. If you have an honest and respectable business you don’t behave with your customers like that. Good information and very well presented. As you imply and I agree, this is not really trading as such, but simply gambling in a thin disguise. It is difficult to find objective reviews, as the majority who lose do not wish to make it public. I really appreciated the examples that you used. Really made the whole picture very clear. Not sure if this is something I would enjoy or not. Very informative! Super complete article. Thanks for sharing.